That’s quite a mouthful of a definition, but it’s easy to demonstrate with an example: If you separate salty water from pure water with a semi-permeable membrane, the pure water will eventually rise as it becomes more salty. That’s because the membrane – a filter medium – only permits the salty water to pass through it into the less salty water until both sides of it have equal concentrations of salt. 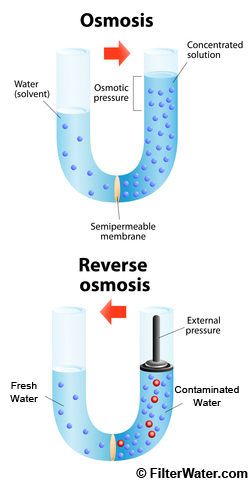 The key to the process is the semi-permeable membrane, which only allows the water to pass through it in ONE direction – from higher concentration to lower. If you’ve been following along, this is the exact opposite of what we’re trying to do. The secret is that the process can be stopped – and reversed – by applying pressure to the water with the higher concentration and forcing it against the membrane. Reverse osmosis has been used in this manner for years to remove salt from seawater to make it drinkable. When the salty water is forced against the permeable membrane, it passes through, leaving the salt behind – thus reversing the flow of water through the membrane and extracting pure water from the concentrated solution. 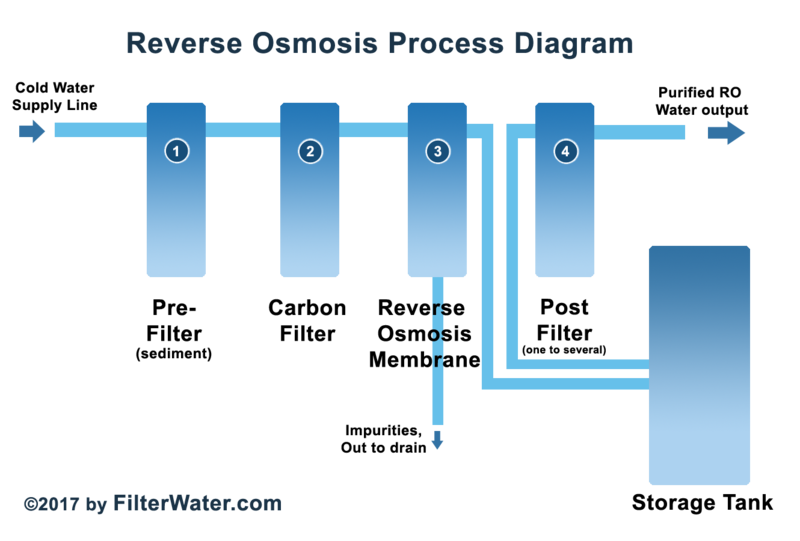 Reverse osmosis is the single most effective way to remove impurities from drinking water, but it works even better in combination with other methods. 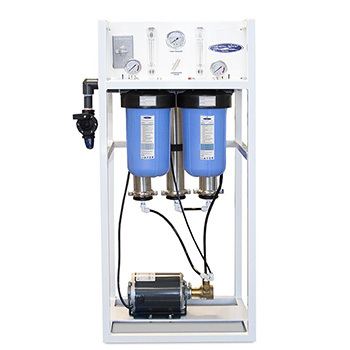 Most filtration systems, both residential and municipal, combine RO with a pre-filtering method to remove large particles suspended in the water that would gum up the filter and reduce its effectiveness. 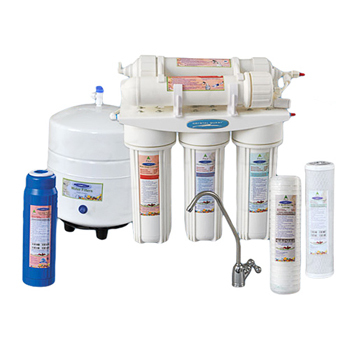 Dissolved particles are then removed by the RO filter – which effectively can remove most minerals, metals and many organic impurities from the water. 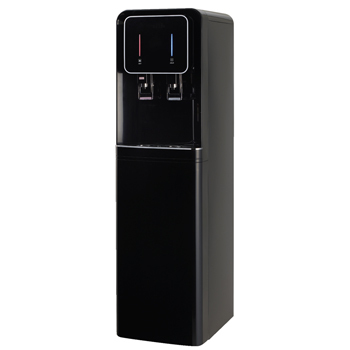 Finally, the filtered water will be forced through a final ‘polishing filter’, often activated carbon, which will remove the remaining bacterial contaminants, and most objectionable odors and tastes from the water. The most important element of the process is the Membrane. It is made from a special material with very thin pours. It is designed to let through only very small molecules, such as H2O. The resulting water is extremely pure and usually close to distilled. 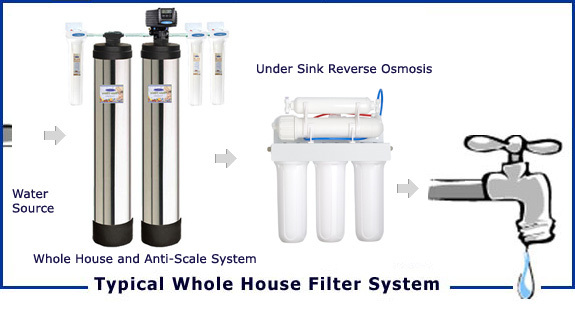 A typical Whole House Water Filtration System consists of whole house pre-filters and tanks to take care of chlorine, tastes and objectionable odors when they enter your plumbing system. A polishing ro system can be installed under the sink to remove elements that are difficult to filter out at whole house, such as salts and some pharmaceuticals. 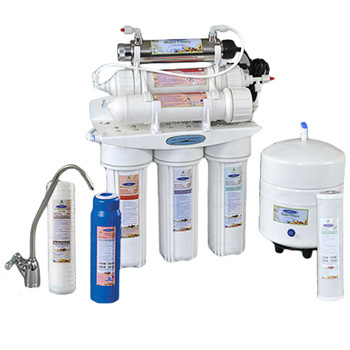 A Commercial (as well as Whole House) Reverse Osmosis system is also a viable option for harsh water conditions. 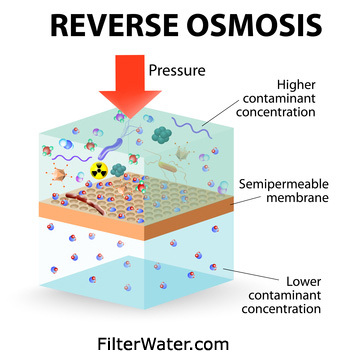 Reverse osmosis filters are one of the most important elements in a home filtration system, particularly if your water is delivered by a well. For more information on water contaminants and proper removal visit the Environmental Protection Agency at www.epa.gov. Ready to see actual products?